While I don’t really have texture issues when it comes to what I eat, I am quite picky about the texture of my beauty products. Runny, soupy beans? Fine. Jiggy gelatin? Cool. Sticky serums and gels? Not so much. 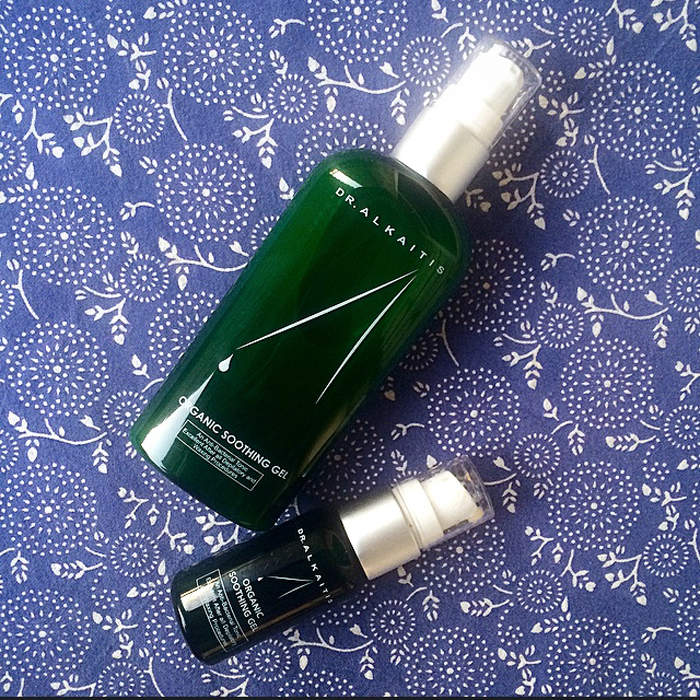 That was the expectation I had going into testing Dr. Alkaitis’ Organic Soothing Gel, but I was pleasantly surprised. This gel has been an absolute winner for my skincare routine during the past few months, and it’s already earned a repurchase and a spot on my top shelf. Designed to calm fussy skin’s that been bugged by waxing and shaving or more inflammatory conditions such as acne, eczema and rosacea, Dr. Alkaitis Organic Soothing Gel gently restores balance with its combination of aloe vera, witch hazel and beneficial organic and wildcrafted herbs. Soothing star ingredients wild chamomile, French lavender, myrrh and seaweed heal the skin while also providing a light, beautiful scent. The combination of these ingredients and more make for a runny base that’s easy to slick onto skin and that dries easily. 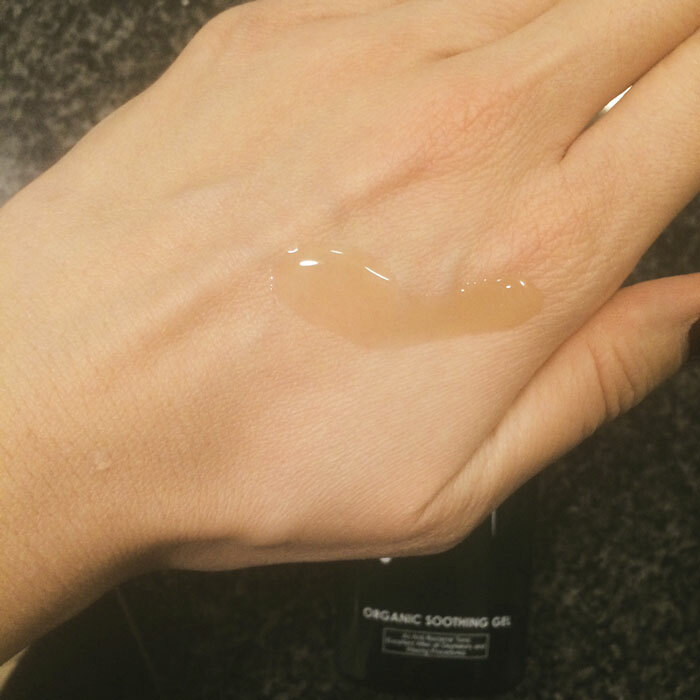 It’s not sticky or gummy at all (I’ve found that some serums have this consistency, which I absolutely despise, as it makes layering product a pain.). One full pump is enough for my face and neck, though sometimes I like to add an additional half pump to bring it down my neck a bit further. I will usually brush my teeth while the Soothing Gel is drying and then layer on my oils and balms as needed. Also, it’s great to note that this is one of those products that, because it’s so runny, can easily be conserved even more by layering it onto a properly toned (aka slightly damp) face, as you can maximize the product by sliding it all over your face. Those who are extremely oily (I would say I’m combination/oily in the winter) can probably even get away with using this just in the T-zone to help tone and purify the oil that typically takes up residence there. As with the entire Dr. Alkaitis line, the ingredients sourced are not there for vanity reasons; the herbs and plants chosen for each formulation are there to perform a task, and the resulting scent of these combinations of herbs is a wild green medicinal that may not be to everyone’s liking. I, however, have become quite taken with the gorgeous green aroma, as it’s an unexpected departure from my typical floral, girly skincare products (that also have high performance behind them, don’t get me wrong!). I’d say that the Soothing Gel, however, has a lighter smell than the rest of the line, as it’s cut with organic grape alcohol, which really thins out the typically heavy smell associated with Dr. Alkaitis. Into our base of Organic Aloe Vera Gel* and Witch Hazelº the following organic and wild-crafted herbals are blended: organically grown grape alcohol* (from the fermentation of organically grown grains). Greater Nettle*, Wild Chamomileº, Myrrhº, European Elder*, Sweet Weed*, and French Lavender*. Curacao Orange*, Benzoinº, Rosemary*, Olibanumº, Wild Fennelº, Balm Mint*, Sea Oakº, Atlantic Kelpº and Red Seaweedº. Also added are natural vitamin B and vitamin C complexes and 100% pure essential oils. * – Signifies certified organically grown; º – Signifies ethically wild-crafted. Since using Dr. Alkaitis Soothing Gel, I’ve noticed that my pores appear a bit more tightened (they are still there, let’s not get crazy) and I’ve had an easier time extracting blackheads. I really think this gel is helping to deep clean everything and loosen up the clogged pores. I’ve also noticed that since I began using this gel, my skin doesn’t feel extremely dry right out of the shower. I’ve become a bit reliant on toners and mists, and while this is what I’d call a toning gel, it feels as though it’s helping my skin regulate itself and not scream for moisture, yet not overproduce oil. To have “normal” skin would be a dream come true! The only thing that I want to call out for discussion about Dr. Alkaitis Soothing Gel is its inclusion of organically grown grape alcohol. There’s a lot of conflicting opinions out there (see Paula, FutureDerm, Paula again, Dr. Oz blog and Truth in Aging) about the long-term effects of alcohol on the skin — is this something you avoid? Is there such a thing as “good” and “bad” alcohols for your skin (we all know what tequila does for your skin…)? Also, I’m hoping for a thoughtful comment back from Trish and gang on this one! UPDATED: Trish has commented! Please do engage with her in the comments section below. What are your thoughts on Dr. Alkaitis Soothing Gel? What else do you like from the line? 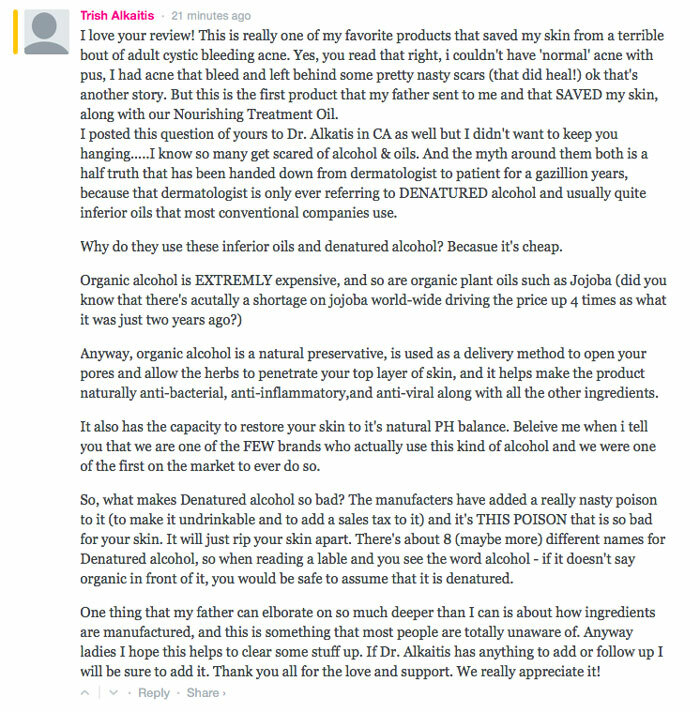 What are your thoughts on alcohol in skincare? Tell me in the comments section!